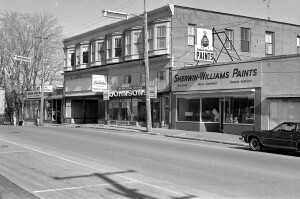 This photo from around 1970 shows the very large business block on Main Street which was occupied at that time and until the building was destroyed in the fire of July 19, 1996 by Johnson’s Hardware. 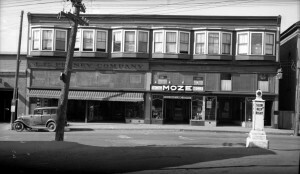 The building was enormous- the portion visible here is only half the structure which backed onto Hog Alley, a couple stories below the level of Main Street.There were 9 large apartments above the store and offices for a attorney, Harold Jewett and a dentist, Dr McTague fronting on Main Street. 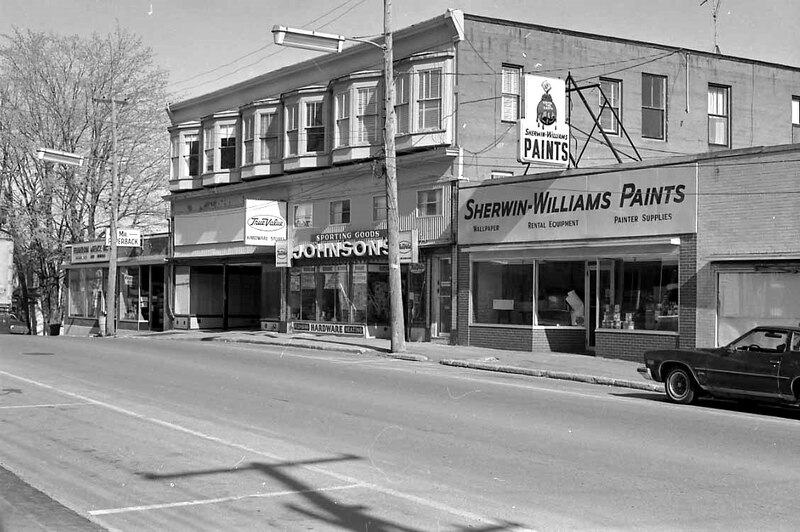 We doubt there was anyone living in Calais from the 1960’s until 1996 who didn’t make regular trips to Johnson’s or its neighbors Mr Paperback or Sherwin Williams. Rocky and Andy Johnson opened the business on Main Street in 1955 after starting out in a small store on North Street, Rocky ran the hardware business and his brother Andy the plumbing business. In this photo Johnson’s has yet to buy the left side of the building which had been occupied since 1926 by J.C. Penney when the block was built by Carl Olsson for his brother Nils. J.C. Penney closed up in the 50’s. Rocky and Andy bought the Penney’s half of the building soon after this photo was taken and expanded their business. 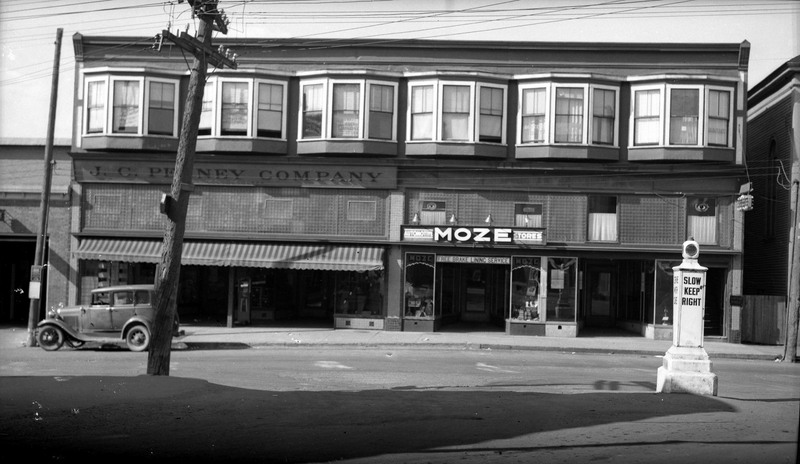 In the 1800’s the part of Main Street across from the intersection of Monroe and Main was still residential. The Knight Memorial Church, which became Sherwin Williams, sat beside a very nice cape which was one of the nicer and older homes in town. Down the street was a harness shop. 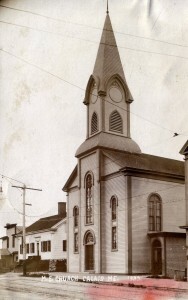 The church wasn’t demolished until 1950 but the cape was torn down in the 1920’s or earlier to build a store for Nils Olsson. In this circa 1920 photo it appears the cape is gone and has been replaced replaced by N A Olsson’s store or gas station on the very far left of the photo..The canopy below the Olsson name resembles the early gas stations but the Olsson’s were almost exclusively dry goods merchants. The Olsson family was Swedish and came to Calais in the early 1900’s. Four of them were involved in construction and retail business, Carl, Nils, Olaf and Oscar. Carl was a master builder who developed a concrete which was, it is claimed, stronger than any before known.He built several business blocks in Calais including the Johnson’s Hardware building in 1926. The wooden block in foreground contained an A and P grocery store, a shoe store and the Palace Movie Theatre. It is now the small park just across from Kendall’s. The store which became Johnson’s Hardware was originally built in 1926 for J.C. Penney. The 20’s was the beginning of the era of “chain” stores- Newberry’s, Woolworth and Fishman’s were already open or soon to appear up the street and many local people were employed in the retail business in the Calais downtown. By 1970 only Newberry’s remained. This photo is taken from the bottom of Monroe Street and shows a “dummy cop” which was placed at important intersections to direct cars to go “Slow Keep Right”. No one paid them much attention. By the 1970’s Rocky and Andy Johnson had expanded into the Penney’s portion of building. 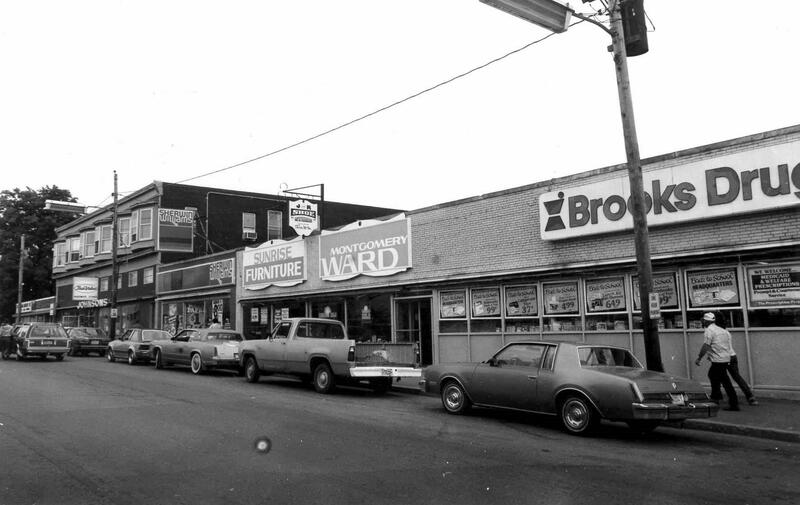 Johnson’s Hardware was one of the most successful businesses in Calais even before the expansion but became an anchor store for Main Street after doubling its size. 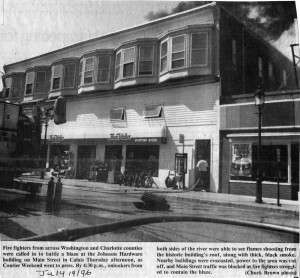 The loss of the store in the fire of 1996 was a severe blow to the Calais Main Street. 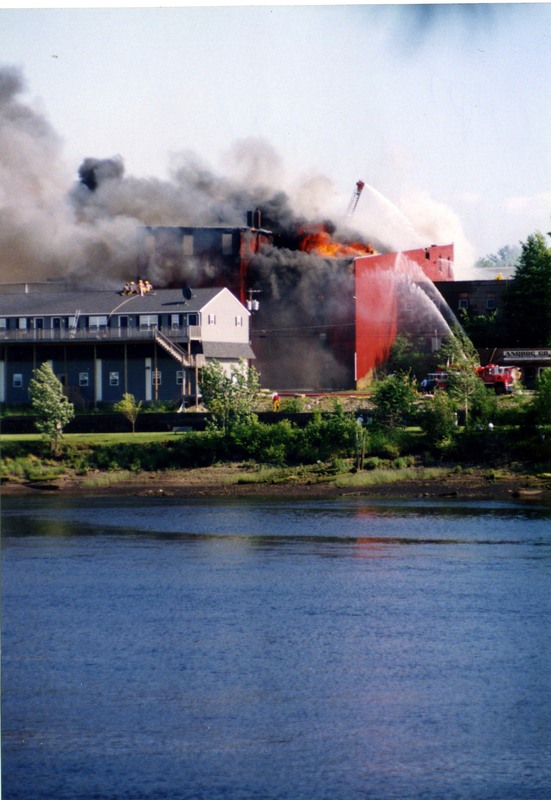 but from the bridge it was clear the blaze was completely out of control. 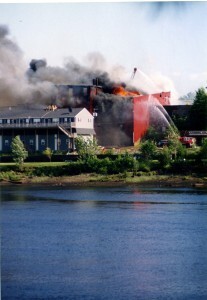 The fire department did everything it could to save the building but there was no possibility of preventing a complete loss. 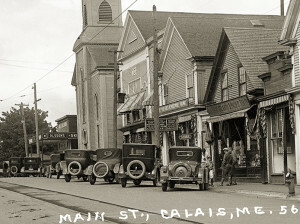 Johnson’s rebuilt on North Street across from McDonald’s and remains today one of Calais’ most successful and oldest businesses.